A day after the Giants got good news about their No. 3 starter, they got bad news about their No. 1. 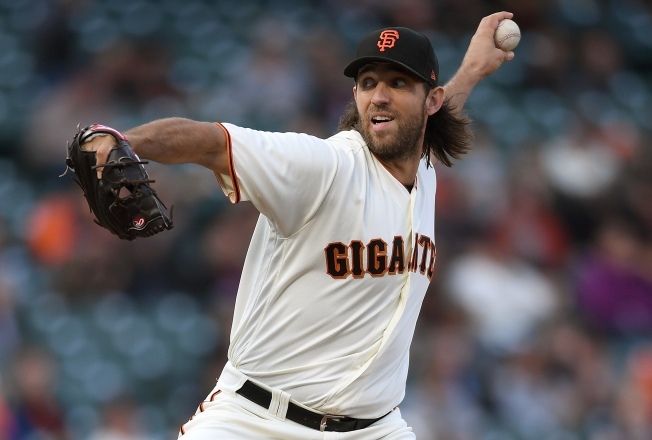 Madison Bumgarner left Friday's spring training game against the Kansas City Royals in the third inning after a Whit Merrifield line drive hit his pitching hand. That left hand is fractured, according to the San Francisco Chronicle's Henry Schulman. There is no prognosis yet on Bumgarner's return, according to Giants manager Bruce Bochy. "Horrible news for us," Bochy told reporters (via Schulman). "That's all you can say about it. There's nothing you can do but push on." Bumgarner, who's scheduled to start Opening Day against the Los Angeles Dodgers on Mar. 29, was making his final start before the regular season. He was off to a strong start this spring. In five appearances, Bumgarner posted a 2.84 ERA and 0.95 WHIP in 19.0 innings pitched. The 28-year-old missed nearly three months last season after injuring his left shoulder in a dirtbike accident.